My dearest friend who gave me the yummy pastel has dengue and she is still fighting for this disease since Monday and we all hope and pray that she will be okay after the blood transfusion. Maybe she got this from her recent Camiguin trip. That is the reason why I’m writing this blog to inform everyone to protect ourselves from dengue and malaria. 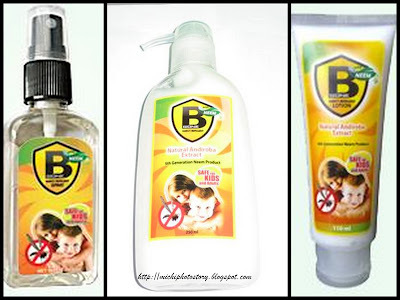 Bgone insect repellent is one of my travel essentials wherever we go in order to have protection against malaria and dengue causing mosquitoes. I’ve been using this product for more than three years already; in fact, I even registered myself to become reseller. I just recently stopped because I have so many things to attend to but I still buy this product for our personal use. There are several organic insect repellent out in the market that we can buy for our protection. It is just a little expensive compared to “off lotion” but it is still best to use organic products like bgone, no bite, giga, and ilog maria insect repellent. Do not take risk; protect yourself and your family. Insect repellent won’t hurt your budget. btw, effective ba ang bugslock and patches? how long kaya effect nito?